Newsgirls waiting for papers. Largest girl, Alice Goldman has been selling for 4 years. Newsdealer says she uses viler language than the newsboys do. 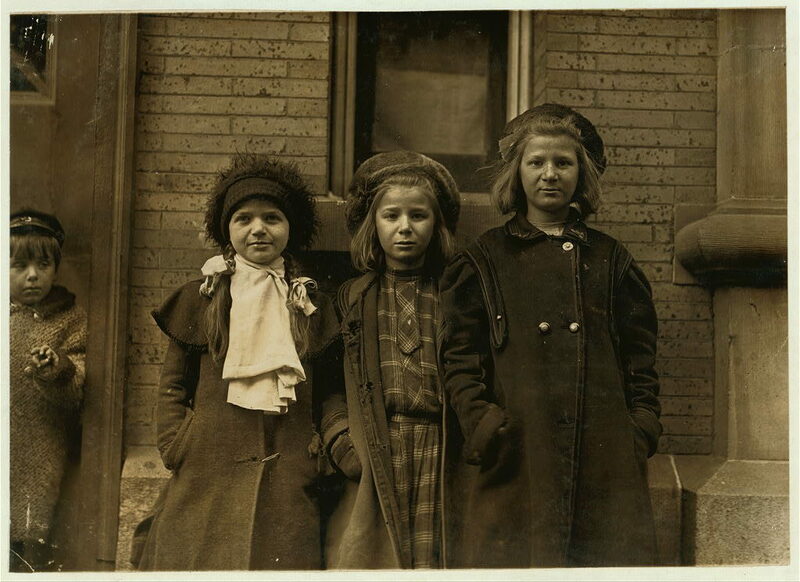 Besie Goldman and Bessie Brownstein are 9 years old and have been selling about one year. All sell until 7:00 or 7:30 P.M. daily. Hartford, Connecticut. Lewis Hine, 1909, for the National Child Labor Committee. Courtesy of the Library of Congress. Newsgirls: Did They Need to be Saved? In the legislative session in the winter/spring of 1917, the fate of Connecticut’s newsgirls was on the table. A bill was put forth that stated that “No girl under the age of sixteen years shall be allowed to sell or offer for sale, or distribute, any newspaper, or other article of merchandise, on the public streets, or in any place, in any city, town, or village, hamlet, or any place with the boundary lines of the state.” A substitute bill specified that this prohibition would only apply to locations with a population greater than 10,000. Children involved in street trading had become an object of concern for the National Child Labor Committee and girls were seen as especially vulnerable to the immorality and dangers of the early twentieth-century city. Unlike the mines and mills, which caused childhood physical deformity and a lack of necessary mental stimulation, the streets were seen a place of dangerous over-stimulation. At the same time, because the “newsies” were a vital part of the distribution of the late afternoon and evening newspapers that new communications and printing technology allowed after 1900, the newspaper industry fought to keep the armies of youth on the streets. And some reformers saw the NCLC advocacy of restrictions on street trading as part of a misplaced middle class moral panic that could make it difficult for working class kids to get ahead. Bridgeport Farmer, Feb. 23, 1917, p. 4, col. 3. This debate played out in Connecticut in 1917. In “Opposition to Bill to Stop Newsgirls Selling in the Street,” Christine J. Hass of the Hartford Council of Jewish Women was said to strongly favor imposing a fine of $20 on girls “for each offense of selling newspapers on the street.” Mary C. Wells of Wethersfield agreed with the restriction because of the dangers of young girls following buyers into the saloons (Bridgeport Farmer, Feb. 28, 1917, p. 4). Others, like the suffragist and attorney and Good Will boys club superintendent Mary Hall, strenuously opposed the bill. 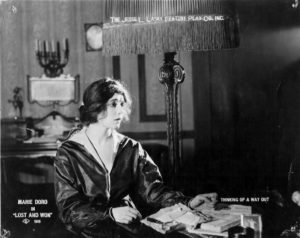 Hall was reported as pleading as early as 1909 for the newsgirls and saying “She remembered the first newsgirl to appear on the streets of Hartford, who was her friend, and this girl has grown up to be fine woman. She never knew of a newsgirl going astray in the moral sense of the word” (Bridgeport Farmer, April 2, 1909, p. 11). The editor of the Hartford Times, W. O. Burr, argued at that same time that regulation should be left up to the individual towns. The attorney Joseph L. Barbour thought it hypocritical that there was no law prohibiting boys and girls from being on the street but only a law proposed to prohibit them from being “busy on the street.” Others testified that a number of young women attending adult education classes earned their tuition as newsgirls. Historians like David Nasaw, who tried to see this world through a more working class lens, noted that the “newsies” had demonstrated remarkable powers of self-organization and self- protection, participating in work stoppages to advance the terms of their relationship with the newspaper companies. In 1913, a “Condensed Telegram” in the November 14 Norwich Bulletin reported that Boston newsgirls were threatening a strike (p. 1, col. 6). The 1917 Connecticut bill ultimately failed and we cannot know from the newspaper accounts exactly what swayed the legislature. Certainly there were committed reform organizations on both sides of the issue. It cannot be ignored that the Burr family of Hartford Times fame were founders and supporters of the Good Will Club and may have had made known their desire to keep the newsgirls selling their paper. Yet, there is no documentation that leads this researcher to doubt the sincerity of those, like Club director Mary Hall, who saw children of the street trade as having it better than other working children. It is clear that the general public saw the newsgirls as potentially part of a romantic “rags to riches” story that the new cities of the early twentieth century seemed to offer. 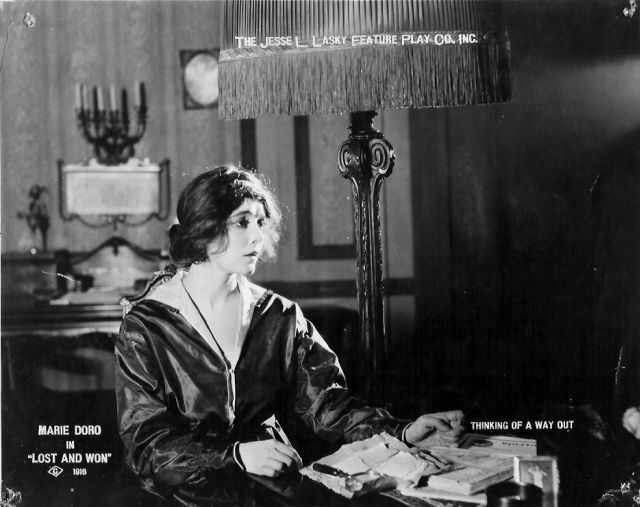 In January of 1917, they were flocking to the Empire theater to see the screen star Mary Doro in “Lost and Won,” in which a little newsgirl is made the ward of a powerful stockbroker, becomes a newspaper reporter for the newspaper she once hawked, and eventually rescues her savior from charges of theft (Bridgeport Farmer, Jan. 25, 1917, p. 13). The historic Connecticut newspapers now part of the Library of Congress newspaper database Chronicling America should be searched by anyone interested in filling in the story of children and labor in our state. DiGirolamo, Vincent Richard. “Crying the News: Children, Street Work, and the American Press, 1830s-1920s.” Diss, Princeton University, 1997. “Empire,” Bridgeport Farmer, Jan. 25, 1917, p. 13, col. 1. “Mary Hall,” The Virtual Hall, Connecticut Women’s Hall of Fame. http://cwhf.org/inductees/politics-government-law/mary-hall#.WLG-2fJQYaI. Nasaw, David. Children of the City: At Work and at Play. New York: Oxford University Press, 1986. “Opposition to Bill to Stop Newsgirls Selling in Street,” Bridgeport Farmer, Feb. 23, 1917, p. 4, col. 3. “Pleas for Newsgirls,” Bridgeport Farmer, April 2, 1909, p. 11, col. 3. Trattner, Walter I. Crusade for the Children: A History of the National Child Labor Committee and Child Labor Reform in America. Chicago: Quadrangle Books, 1970. State Library catalogue record: http://www.consuls.org:80/record=b1786988~S1.